EL ESTOR, GUATEMALA--Arriving in El Estor on the evening of Janurary 7, it was evident that something was amiss. Dozens of police vehicles clogged the thoroughfares of the nearby town of Rio Dulce and police were everywhere. The following morning, it was clear that evictions were imminent. 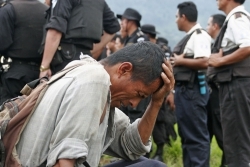 Having mustered at the headquarters of CGN-Skye Resources at 8am, 430 police backed by approximately 200 members of the state military travelled the road to Barrio Unión, a reoccupied community made up of about 70 families. The police made their numbers very clear, forming a line between Barrio Unión and the main road. Public prosecutor Rafael Andrade Escobar read the eviction notice. In retrospect, and disregarding the injustice of the eviction, what happened at Unión was carried out in a measured manner. The community was given time to vacate and the housing structures were carefully dismantled by groups of workers employed by CGN-Skye Resources. A second eviction happened later that day in a community called La Pista, where the community had decided to vacate before the police arrived. Their structures were dismantled with less care and some were burned. As night fell, locals speculated about the eviction of Barrio Revolución, one of the largest and best-organized of the communities. The morning of the 9th, the police and army mustered again at the CGN-Skye Resources headquarters. Police trucks lined the road in a grim parade, stretching for hundreds of metres and each carrying four or more heavily armed, black-clad policemen. Armed private security guards rode in a white pickup, wearing company t-shirts. Other security guards were positioned on the cliffs along the roadside and from above, a helicopter carried out flyovers of Barrio Revolución and Barrio La Paz. At about 9.45am, the convoy began to roll towards Barrio Revolución. Instead of sending a public prosecutor to read an eviction order, elite squads of riot police entered Revolución, moving up the river that runs through the centre of the community. Once the river was secured, police began to encircle the area, closing the people of Revolución into the western portion of the area, where many were congregated in their gathering place, awaiting the arrival of the public prosecutor. Surrounded by police, about 50 people waited for the public prosecutor to read them the eviction notice. Among them were about a dozen women, including a mother holding her infant child and a few younger children. Time passed, and the police completely sealed off the area where people were gathered. In the distance, an orange spot appeared. As it grew, brown smoke began to rise up into the air; a house on the other side of the river was burning. Public prosecutor Andrade Escobar stood aside while a second house was set on fire, and then a third. He claimed that there was no signal on his cellphone to order his men to stop burning. 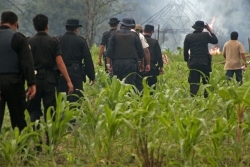 Andrade Escobar continued to claim that the order to stop the burning had not arrived to the other side of the community. He claimed that he would have the Public Ministry press charges against the company employees that were burning the houses of the families of Barrio Revolución. When asked why company employees were burning homes when it is the Public Ministry that was to carry out the eviction order, Andrade Escobar responded: "I handed authority over that section of the area over to a [CGN-Skye Resources] lawyer, therefore those responsible for this are company employees, not the Public Ministry." After nearly every home in the eastern section of Barrio Revolución was on fire, the two dozen people hired by the company to destroy homes were stopped. While heat continued to radiate from the smoldering structures, approximately 60 members of the army filed across the field and into the forest surrounding the community. Ceasar Bora of the Indigenous and Peasant National Co-ordination (CONIC) described the situation as having "the same characteristics that we saw in many other cases during the internal conflict." Their houses now replaced by charred wood, the community remained sealed-in by police and the army, while Andrade Escobar read the eviction notice. He ordered the residents of Barrio Revolución to dismantle their homes if they hadn't already burned. Some community members fought back tears; others stood quietly. Speaking as tears ran down his face, one man said, "They just burned my home. Where will my children sleep tonight?" Having obeyed and respected orders from the police, people’s houses were burned illegally in a show of force by company employees. After reading the eviction order, Andrade Escobar quickly left the area to carry out a fourth eviction, in Barrio La Paz. After the disaster in Revolución, the eviction in La Paz seemed peaceful, though the legal grounds for it were heavily contested. More evictions are planned in the coming days and hundreds of peasant families have been made homeless in less than 48 hours. As the long afternoon wore on, the people of Barrio Revolución and Barrio La Paz worked tirelessly dismantling the remaining homes, under heavy police supervision. A sprinkle of rain turned into a heavy afternoon shower and there was nowhere to go for shelter. The refrain of these communities, as they stood alongside the highway with their belongings, was unanimous. "Development brings eviction; development brings displacement." The future is uncertain. Even as community members deal with the loss of their homes and possessions, the depth of their desire to live off the land remains profound. Unless the company and the state of Guatemala change their strategy radically, or the Canadian government steps in to intervene in the activities of Skye Resources in Guatemala, the ramifications of this conflict will continue to intensify. Welcome to 2007; this is what development looks like.